What could be better than Dark Horse Comics' series of LITTLE LULU trade reprints? 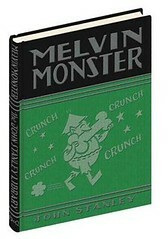 How about reprints of every other wonderful thing John Stanley has done, from MELVIN MONSTER to NANCY & SLUGGO? - Why doesn't this new WHERE THE WILD THINGS ARE poster show a Wild Thing? I'm part of an Archie joke? Sweet! Great set of links. Fans of John Stanley should check out the Stanley Stories blog too. Lots of great examples of his work there.